Thai herbal ball massage was long ago developed in Thailand to detoxify and relax the body in a single treatment. 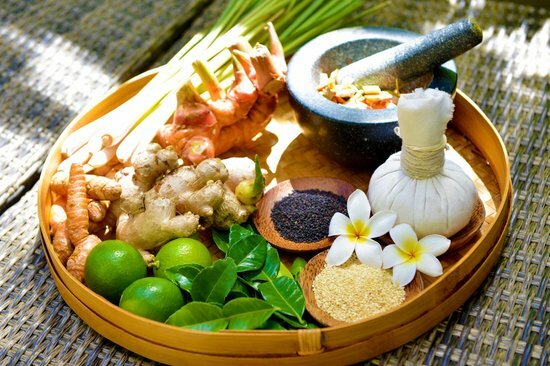 It combines the benefits of traditional Thai massage with the therapeutic powers of blended Thai herbs. Lanna Thai Massage uses balls handmade specifically for us in Chiang Mai, Thailand with a selection of therapeutic organic and naturally sourced herbs which are wrapped in a muslin cloth and tied into a ball. The ball is then steamed gently and applied to your body in mild pressing, circular and rolling movements. The heat from the ball transfers the herbal essences and essential oils deep into your skin – resulting in the release of muscle tension, detoxification, and increase in body energy. Thai herbal ball massage potential benefits that go far beyond general relaxation and rejuvenation. Heat from the herbal ball helps to dilate the blood vessels which help in increasing the circulation of blood and oxygen in the body. The different types of herbs used in the mixture of our Thai herbal ball are rich with analgesic and antiseptic properties. The healing effect of the herbs soothes muscle pain, while also relieving joint pain. Thai herbal ball massage induce deep relaxation and eases the tension in your muscles and energizes and rejuvenates your body. The herbs used in the massage also have anti-inflammatory properties that sooth skin and joint inflammation. Ball massage treatment cleanses your skin by promoting cell growth nourishes and revitalizes the skin. Thai massage in general releases the tension in your body, and when it is blended with a warm herbal ball massage, it further detoxifies your body releasing all stress and tension – bringing you in a peaceful and calm emotional state. Thai herbal ball massage at Lanna Thai Massage is a totally relaxing treatment to unwind your body and rejuvenate it fully.